Tongue-in-cheek, we refer to ourselves as the Southern Ontario “Glider” Group, but our aircraft are more properly called “Sailplanes“. The sophisticated design of Sailplanes permits them to routinely exceed initial launch height by exploiting rising air. We fly a variety of model sailplane types for fun, and for competition. We encourage the construction of models from kits. It’s also possible to purchase Almost-Ready-to-Fly (“ARF”) sailplanes. Some sailplanes are self-propelled to reach their initial launch altitude, at which point their electric propulsion motor is shut off. These “Electric Sailplanes” typically employ a lithium polymer (LiPo) battery and brush-less electric motor with folding propeller. To participate in Electric Sailplane contests, your “Electric Sailplane” must have an on-board device to shut the motor off at a specified altitude and within a specified motor-run duration. This ensures that every competitor begins the search for lift from the same initial launch height, focusing the competition on soaring skill, rather than on propulsion capability. Alternatively, you can fly traditional “Pure Sailplanes” which have no on-board propulsion motor. Instead, to gain their initial launch height, an external launching device which is not part of the aircraft is used. Eliminating the on-board propulsion system improves soaring performance by reducing the aircraft’s weight. But if rising air cannot be found, a forced landing may result, sometimes at some distance from the launch point. The most common types of external devices for launching Pure Sailplanes, are the electric “Winch” powered by a lead-acid automobile battery, or a “Hi-start”, which is a catapult powered by stretched rubber. Either device is coupled to the aircraft by a long towline, which is jettisoned when the aircraft reaches its’ launch altitude. 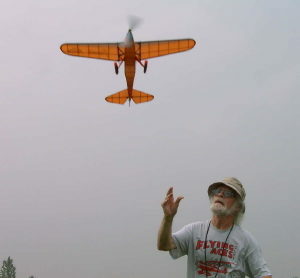 Other Pure Sailplane types include Discus Launched Gliders (“DLG’s”) and “Slope Soarers”. DLG’s usually operate from flat fields, and are pitched “side-arm” into the air by their pilots. DLG’s are smaller than line-launched sailplanes, and are very lightly built to make best use of the available human launch energy. “Slope Soarers” are launched from the top of a hill with an overhand throw. For slope soaring, windy days are preferred because the lift is created by wind deflected upward by the face of the slope. Landing a Slope Soarer on a hilltop requires considerable skill, particularly in high winds or gusty conditions. Slope Soarers must be very rugged to withstand rough landings. 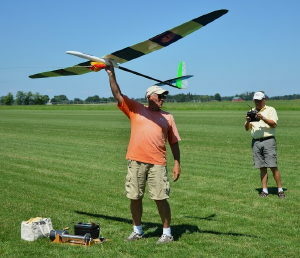 For competition, model sailplanes may be further categorized by wingspan, and by the quantity of their radio controlled functions. In contrast to “Slope Lift”, “Thermals” are columns of warm air that typically rise up from flat fields on relatively calm days. The location of thermals can be predicted by paying attention to subtle changes in air temperature, windspeed and wind direction. A host of additional telltales exist, including the behaviour of nearby soaring birds, the motion of tree leaves, flying insect behaviour, and the formation of clouds. By rising or sinking, the sailplane itself visibly signals if it is in a thermal. On-board variometers are also available to measure and report rate-of-climb (or sink) via radio downlink from the aircraft. High performance sailplanes can glide in dead air at relatively high speeds for a long, long time. This enables them to search for thermals over a wide territory. Lower performance sailplanes fly slower, sink more quickly, and cover less territory. Essentially, low performance sailplanes must wait for rising air to come to them. Either way, unless rising air is encountered, even the best sailplane will eventually be forced to land. The pilot steers his model in order to find Lift. Once Lift has been detected, strategic manouvers are employed to insert the aircraft into the Lift, to locate the boundaries of the Lift, and to keep the aircraft centred in the Lift, and rising. SOGGI’s “Thermal Workshop” has become a popular annual event. This Workshop for club members and visiting pilots, teaches thermal hunting theory mixed with thermal hunting practice time. 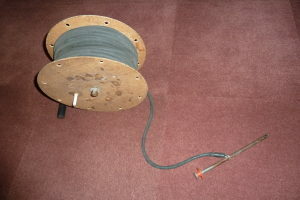 The reel (at left) contains a typical “Hi-start” catapult consisting of 100 feet of black rubber tubing, connected to a mono-filament towline, which in turn is connected to a parachute. An initial 300 feet of stretch produces an initial 15 lb. pull from the rubber. A parachute assists in the release of the launch-line from the aircraft. Hi-starts are typically less powerful than electric winches, but are also less expensive, and are easier to set up on the field. SOGGI has hi-starts and winches for beginners to learn on. 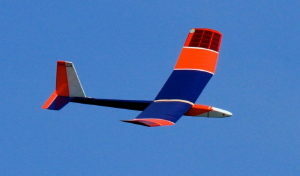 An all-composite factory-built “Supra” pure sailplane is ready to launch. An orange parachute is seen connecting the aircraft to the towline. The towline extends forward from the aircraft to a turnaround pulley anchored to the sod about 150 meters away, and then returns to the winch seen at lower left in the photo. In order to launch the aircraft, winch drum rotation is controlled by tapping a foot switch. 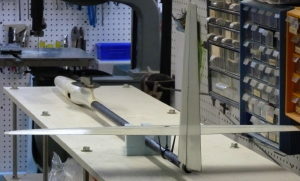 One of a pair of homebuilt “Supra” pure sailplanes under construction. It’s made entirely of composite materials such as carbon fibre, Kevlar, polystyrene foam, and epoxy. This is not a beginner’s project, but is included here to illustrate that fairly sophisticated construction methods are possible when club members combine their skills and resources. Gentle Lady 2 Meter Pure Sailplane; This is one of the greatest balsa wood model airplane designs of all time. Cheap, easy to build, easy to fly, and it has decent performance. Build your own or buy it complete. Thousands of pilots have flown one of these. Discus Launch is about to happen. Launch heights in excess of 40M can be achieved by the skillful. Long soaring flights are possible, provided you launch in good air, and then work the lift quickly. 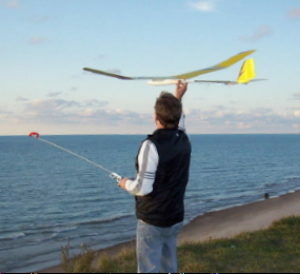 Launching a slope soarer from a dune at Lake Huron; A steady onshore wind deflects upwards from the face of the dune. On the right day and at the right hill, extended flight times are possible. Good pilots equipped with a suitable slope soarer, can perform a wide range of aerobatic maneuvers . Electric sailplanes have folding propellers to reduce drag, and to avoid propeller breakage when landing on their belly. At left, is an Almost-Ready-to-Fly (ARF) electric-sailplane of molded foam construction, having a wingspan of about 1 meter. Some ARF’s are supplied with radio control systems already installed, and some also come with gyro stabilization. ARF’s represent one possible option for entry-level pilots. The features, performance, durability, repair ability and cost of ARF’s varies widely, so ask around. 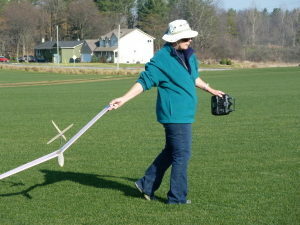 Several radio control systems may active on the field at the same time. Two-way spread-spectrum radio technology similar to that used by cell phones, prevents mutual radio interference. The radio control systems used for sailplanes vary widely in complexity. 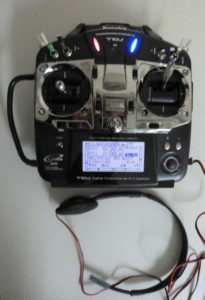 The moderately complex transmitter shown here can control a sailplane having up to six independent control surfaces and a motor. One program is created in the transmitter for each sailplane in its’ inventory. During flight, two control sticks move the control surfaces. Various switches configure the control surface response to the sticks for launching, soaring, or landing. “Gyro” stabilization devices are available to sense and counteract instability caused by turbulence, thereby improving glide performance. Sailplanes can also be equipped with instruments to sense altitude, rate-of-climb, on-board battery voltage, etc. This information is fed to the pilot via radio-downlink. 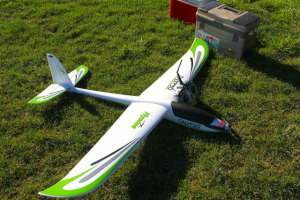 Within SOGGI, we also have a small group that enjoys building and flying rubber powered freeflight models. These “stick-and-tissue” models are beautiful, cost very little, and are relatively easy to build. “Freeflights” have no radio control system. Instead, their control surfaces are pre-set for flying in lazy circles while drifting with the breeze. A rubber-band “motor” can provide enough energy for launch heights to exceed 100 feet. An onboard timer prevents fly-aways. Freeflights can’t search for lift, but great altitudes and extended soaring flights are possible if your launch coincides with the arrival of a passing thermal. Thermal prediction and detection are key to success.